George Street in Sydney is the oldest street in Australia. It started out as a track from the site of Captain Arthur Phillip's settlement at what is now The Rocks, leading southward into the area of today's Central train station. It became colonial Sydney's main street, taking the name of High Street as was the English custom at the time. The current generation of Sydneysiders, as well as visitors to Sydney, may be forgiven if they think George Street, as this thoroughfare is now known, was named to honor King George VI of England, father of Elizabeth II. Since there is also a major thoroughfare parallel to George Street that is named Elizabeth Street, it is easy to believe that Elizabeth Street honors Elizabeth II who is, as well, Queen of Australia. George Street was actually named by New South Wales Governor Lachlan Macquarie in 1810 to honor George III (1738–1820), the reigning English monarch of the time. As for Elizabeth Street, this wasn't named for an English queen but for Governor Macquarie's wife, Elizabeth Henrietta Macquarie (1778–1835). George Street, which starts in the city's south at the intersection of Harris Street, continues west as Broadway and eventually Parramatta Road, which is part of the Great Western Highway. Toward the city, it heads a short distance to Railway Square—so named because Sydney's major rail, bus, and tram interchange, Central Station, is right there—and then north through the city all the way to The Rocks. At Central, by which shortened name Central Station is popularly known, you can catch city trains to the suburbs as well as country trains to cities and towns in New South Wales and other states and territories. These trains include the long-distance transcontinental Indian Pacific to Perth with connections in Adelaide on the Ghan to Darwin. The tram, on Sydney's light rail system, originates at Central and takes in Chinatown, Darling Harbour, The Star gaming complex at Pyrmont Bay, and Sydney Fish Markets in Pyrmont on its route to the inner west suburbs of Rozelle and Lilyfield. Bus stops are located at Central Square and along Eddy Avenue off Pitt Street and on Chalmers Street on the eastern side of Central. Off George Street, west through Hay Street, enter Sydney's Haymarket area and Chinatown. The markets are a popular place for bargain-hunters and the restaurants in the vicinity of the Dixon Street pedestrian mall offer a variety of fare for Chinese food lovers. If you walk east on Campbell Street, Sydney's Capitol Theatre, which is home to stage musicals through the years, is a short distance away. Close by, heading north along George Street, is the Event Cinema complex where you might want to catch one of the latest movies in town. This is the home of the local government of the City of Sydney, which comprises the Sydney central business district and the surrounding inner city suburbs. The whole of the Sydney metropolitan area does not fall within the jurisdiction of the City of Sydney local government. The city local government is headed by a Lord Mayor, which can be either a man or woman despite the masculine term. Aside from the council chambers and council offices, Sydney Town Hall is also often used as a venue for concerts, balls, exhibitions, and other events. Its main steps fronting George Street are a familiar meeting place. This 1898 building, threatened with demolition in the late 1950s, was renovated and restored to its former Romanesque architectural grandeur. The building is a monument to long-reigning English Queen Victoria (1819–1901) who reigned as monarch of the United Kingdom of Great Britain and Ireland from June 20, 1837. Today, the Queen Victoria Building is a complex of shops and a number of eateries easily accessible from Town Hall train station and central Sydney itself, and by buses traveling through George Street. Martin Place, arguably Sydney's best-known pedestrian mall, lies between George Street and Macquarie Street in the heart of the city's business district. A well-known feature of Martin Place is the cenotaph honoring the Anzacs of World War I, which is the traditional site of Sydney's Anzac Day dawn ceremonies. Martin Place is also a venue for festivals and other special events. The nearest train stations are at Wynyard with a George Street entrance and at the eastern end of Martin Place itself. Martin Place is a popular meeting place for both city workers and visitors, particularly at lunchtime on working weekdays. 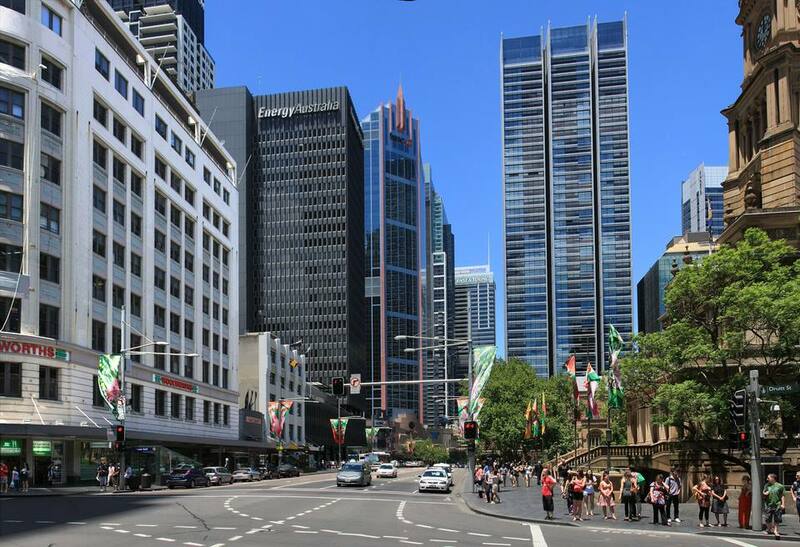 Close to the northern end of George Street are the ferry jetties, train station, and bus stops at Circular Quay, which is a convenient starting point for visits to Sydney Opera House, Royal Botanic Gardens, The Rocks, and the Museum of Contemporary Art Australia. On either side of Circular Quay, particularly on the way to the Opera House in the east and at the Overseas Passenger Terminal in the west, are a number of fine restaurants. Where else but The Rocks, which is the birthplace of modern Australia, to complete an exploration of George Street that ends beneath the southern end of Sydney Harbour Bridge? This is where it all began in 1788 with the arrival of the First Fleet and the start of the European settlement at Sydney Cove by Admiral Arthur Phillip (1738–1814), head of the First Fleet and first governor of New South Wales. Here began what is now Sydney's George Street.